The subjects of a still life work can be anything that does not move or is dead. In the seventeeth century the genre of Still Life in the visual arts was relegated to the bottom of the Hierarchy of Arts, because it did not incorporate human subjects. Up to the sixteenth century religious subjects predominated in Western Art, but artists incorporated portrayals of everyday objects, which were often used for their symbolic messages. Compositionally, I wonder if this painting utilises the principle of the Golden Rectangle, with the brilliant red four poster bed in which John the baptist has been born, occupying this space. The red is then echoed around the painting to draw the eye to the other components of the composition. In the painting by Petrus Christus, ‘The Annunciation’, a vase of lilies occupies the central foreground of the composition. Lilies symbolise virginity, purity of mind, and occupy this prominent position in order to emphasise the pure and undefiled state of Mary. The strong vertical and horizontal lines hold the composition together, whilst the central line of contrasting tiles (tonally stronger than the surrounding tiles), draws the eye towards the open doorand the depiction of the exterior, which gives the painting depth. 15th-century Early Netherlandish painting in illuminated manuscripts and on panels often included stylised and illusionistic displays of flowers and insects.Once printing took the place of illuminated manuscripts the same skills were employed in scientific botanical works. The artist Joris Hoefnagel worked in this way, as demonstrated in his painting below. Gradually form the Sixteenth Century onwards, the religious content diminished and the drawing and painting of objects such a foods, meats, game, flowers developed as subjects worthy of study in their own right.This evolution followed the increasing interest in the natural world, and the collection of specimens by wealthy patrons. By the end of the 16th century, Dutch and Flemish paintings of flowers both as aesthetic objects and religious symbols created a strong market, usually sold through markets and by dealers, rather than as commissioned pieces, thus allowing the artists considerable freedom in their choice of subject matter and composition. In the work below, by Jan Bruegel the Elder, the tulips together with the diamonds may be signifying the wealth of its purchaser. The painting uses a muted tonal palette and the eye is drawn around the painting, following the subtle variations in shade between the flowers. The diamonds are easily missed, and I would not have noticed them, if it were not for the title of the work. I do not know if this is a deliberate tactic used by the artist to relegate the material trappings of wealth to a lower order than those that are “God-given”. The partition of the Christian faith into Catholicism and Protestanism influenced the subject matter of still life painting, since the Dutch reformed Protestan Church did not allow the portrayal of religious subjects. Thus in the Catholic Southern Netherlands, Antwerp artists Jan Brueghel the Elder and Hendrick van Balen began to paint images with a central, often religious image, encirled by wreaths or garlands of flowers and foliage. Garland paintings as they came to be known, were simple in their composition, using the circular arrangement of organic structures to emphasise and to draw the eye to the religious figures. This style acheived great popularity as decorative pieces in peoples’ homes. In the 1640’s Flemish artists such as Frans Synders and Adriaen van Utrecht began a separate genre of still life which emphasised abundance, incorporating varied objects, often including fruit and flowers, dead game, food stuffs, alongside living people and animals. Figure 6. A Larder Still Life with Fruit, Game and a Cat by a Window. (oil on canvas) Snyders or Snijders, Frans (1579 – 1657). In this composition, the sumptuous basket of fruit, with its contrasting tones and colours acts as a focal poit. The bright shine on the grapes is echoed by the light issuing from the window and I see the eyes of the cat fixed on the bared teeth of the dog in the lower left corner of the composition. My eye is then drawn back to the friuts and then round in a smaller circle to the rabbit tail, the breasts of the dead game birds and lastly the pale asparagus shoots. all this is acheived through the use of light tones, including the spreading white fabric laid across the deep red table cloth. I love this painting for its humour and its over-statement. 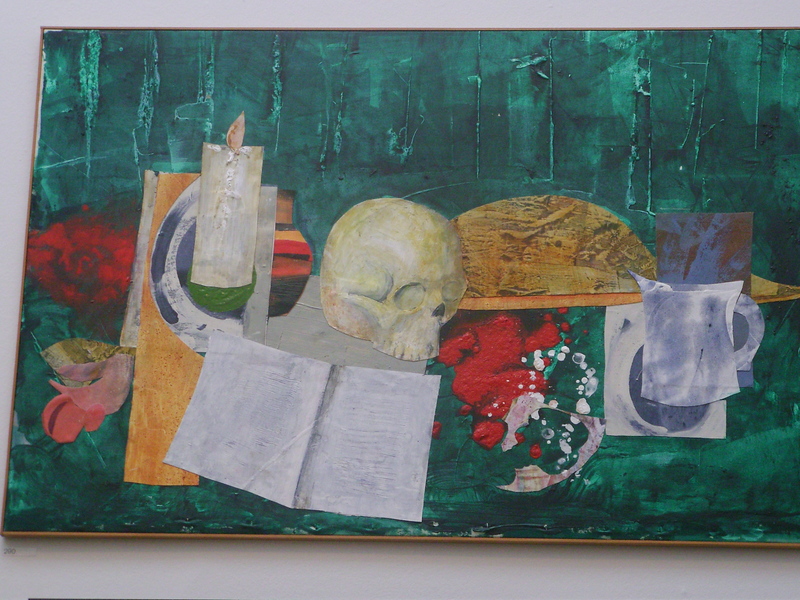 Another popular variation was the so-called vanitas paintings which included objects symbolic of the impermanance of life amongst the sumptuous variety of objects assimilated for display. The fruits and flowers painted were sometimes showing signs of early decay to bring the point home more strongly. Still life production in the eigtheenth century reduced, but followed the same style as that of the 17th-century. In the nineteenth century, the rise of the European Acadamies of Art resulted in the relgation of the genre of still life to the lowest in the “Hierarchy of Genres”.Artists such as Constable and Corot used landscapes to glorify nature rather than still life. The Realist and Romantic artistic revolutions from the 1830’s on led to the inclusion of still life into the work of artists painting in those styles, such as Francisco Goya, Gustave Courbet and Eugene Delacroix.They used natural subjects such as flowers and fruits and dear game, fish, and were largely representational in their approach, although Delacroix in his Still Life with Lobsters has a romantisised landscape for the background for his subjects. The Academies in Europe declined, and the rise of Impressionism and Post-Impressionism resulted in an increased enthusiasm for the genre of still life and a change in subjects. There was a move away from the predominance of dark backgrounds and clour became a dominant feature, not always represented as true to life.There were also deliberate moves away from true perspective, and this foreshadowed the development of the cubist movement, especially in the work of Paul Cezanne. The first forty years of the Nineteenth century was a time of innovation and movement within the art world as the approach to art moved ever further from realism towards abstraction. This trend was clear in the treatment of the still life works of Les Nabis, a group which developed from the post-impressionist movement and included Pierre Bonnard and Edouard Vuillard. Henri Matisse flattened and altered objects even further, as did other exponents of the Fauvist movement, Andre Derain and Maurice de Vlaminck. In this work, the designs in the fabric of the cloth and the wallpaper are as important in the composition as the objects, which are painted almost as if the form part of the designs. The objects in this drawing below by Georges Braque are simply and sparsely outlined and the perspective is not true, especially for the basket of apples which is seen from above. There is subtle shadowing over the entire picture plane which suggests that the objects are bathed in light coming through a window from in front, and that the shadows may be from leaves on trees or some other changeable forms. There is no strong influence of cubism in this work, which has a delicacy which I have not seen in the paintings of the same artist. Picasso’s “Still life with Chair Caning” is another bold move in the deconstruction of objects and uses a combination of real (but illusiory) oil-cloth, rope and a cubist painting depicting the objects on a table top. Figure 17 Picasso, P. (1912). Still Life with Chair Caning. See the following link for a discussion of the work. American Artists, becoming aware of the Modernist movement in Europe, began to combine American realism with Cubist-derived abstraction to produce works such as the two below. In Mexico Frida Kahlo began to paint still lifes in their own surrealist style, using exotic friuts and indigenous motifs. The pitahaya is a yellow fruit which is fleshy and watery, growing in the desert. kahlo has painted it in a decaying state, and it has been suggested that the painting represents her idea of death. This painting is typical of many by the same artist, in its subdued colours and tones and the choice of objects. The objects are viewed at a point only slightly higher than eyelevel and they overlap significantly. There is a vertical line mid way up the canvas where the openings of the two vessels coincides with a change in shape of the flask. This blurs the edges of the objects, especially as the flask and cylindrical vessel are almost the same colour. Similarly, the conical edge of the flask not in shadow is barely discernable from the background. In spite of the depiction of shadow, the whole composition has a flatness, and is understated. Abstract Expressionism reduced still lifes to blocks of colour and form and it wasn’t until the emergence of Pop Art in the 1960’s and 70’s that physical objects were used as subjects, but they were generally used to highlight the state of commercialism in Western culture, rather than to communicate something about the objects and their arrangement. The following works are examples of abstract expressionist still lifes. The work below, which belongs to the style “Tachisme”, is interesting in its abstraction of the objects and their positioning and flattening in perspective which creates an impression of a stone wall or grid. Tony Cragg has used objects relating to scientific research in a series called Laboratory Still Life. James Valerio draws photorealist still lifes which acheive a portrayal of the texture of his subjects that is so real one wants to reach out and touch the paper. Stephen Fisher also draws photorealistically and his compositions draw the viewer into the picture and set up a questioning of the purpose behind the actual process of drawing, when the images could have been produced with far less effort digitally. Why go to the trouble? In sharp contrast, Katie Sollohub, selected for the 2014 Jerwood Drawing Prize, presented a charcoal on paper drawing entitled On the Edge which is rough, takes little account of perspective and makes little attempt to be realistic. In a Still Life painting she is more representational, but still not realistic. Figure 7. Collyer, Edwert (1663) Vanitas Still life with Books and Manuscripts and a Skull [oil on panel] Available at: https://commons.wikimedia.org/wiki/File:Edwaert_Collier_-_Vanitas_-_Still_Life_with_Books_and_Manuscripts_and_a_Skull_-_Google_Art_Project.jpg[Accessed 17/02/2016].